Gabe and I had dinner at a Jewish deli in Minneapolis for the first time last week. We were frequent visitors at Zaftigs in Brookline, and I’m proud to say that I’ve eaten the as-tall-as-my-face pastrami sandwich at Brent’s Deli in Los Angeles. So it was borderline absurd that we’d made it eight months in Minnesota without a stop at Rye Deli. Despite the fact that a crazy hailstorm rolled in and we had to grab our food and run– getting the car safely under covered parking just in the nick of time– it was a fantastic experience. And now I’m even more obsessed with trying Jewish recipes. Matzo ball soup? Check. Challah? Check. Next up? Pickles! I was one of those kids who used to drink pickle juice for fun, so it was with glee and a slightly manic expression that I bounded through the grocery store carrying four ginormous cucumbers and declared for all to hear, “I’m going to make pickles!” Sometimes I can be embarrassing to shop with. Place garlic and red pepper flakes at the bottom of the jar. Add two sprigs of dill and the cucumber spears. Make the brine by stirring together water, vinegar, and salt until salt is dissolved. 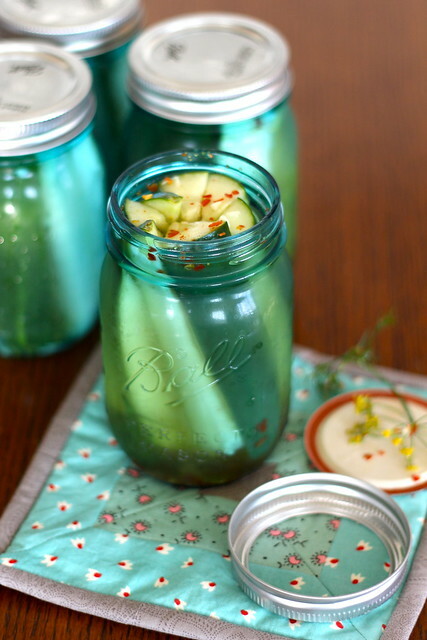 Pour brine over cucumbers in jar. Top with another sprig of dill and tighten lid on jar. Place in refrigerator and wait two days before eating. Enjoy! Source: Very slightly adapted from Annie’s Eats. This entry was posted in Side Dishes, Snacks and tagged DIY, healthy, jewish food, tourist town, vegetables, vegetarian by krista. Bookmark the permalink. These look delicious. 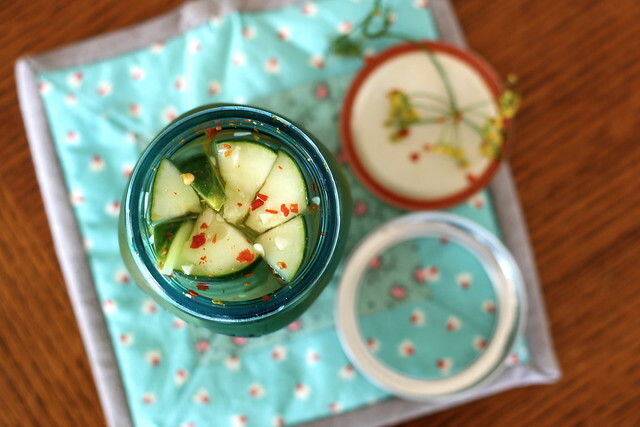 So you used no pickling spice? hmmm. Last year, I made some and put garden habanero slices to kick ithem up a notch.